This floral feeder is bound to bring all the birds to the yard. You're not the only one drawn to Mexico's beautiful pottery and glass art. Hummingbirds are sure to be lured by this artisan-crafted feeder, which holds a trio of handblown recycled-glass bottles topped by red flowers. 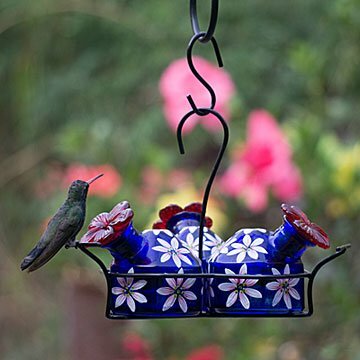 Each of the eye-catching blossoms has a perch, so your feathered visitors can rest while feeding, and the bouquet-style arrangement comfortably accommodates three hummingbirds at a time. The metal frame is weather-resistant, and the glass flowers are easily removed for cleaning. Hand painted by artisans in Mexico. Beautifully made. My father just loved it! Not only am I going to purchase one for myself-everyone I showed it too wants one! So beautiful! This was sent to my daughter very promptly. She says it is really beautiful and can't wait to be using it. It was a gift but she loved it! Yes I would. I love your gift ideas and good service. Fun to watch Hummingbirds use it. The Sensor Amethyst was a very appreciated gift and useful. Very lovely feeder that doubles as yard art... just lovely to look at. My husband and I have a love for birds and used a plainer humming bird feeder. We are looking forward to hanging this in the Spring.